If you ever need a bright spot in January, just head over to Kathy’s place at Backyard Bird Nerd, where I was met with yet another stunner last week. Birds were the first thing I became interested in drawing when I got started over a year ago, and I think they are still my favorite subjects. I got help from Derwent’s Graphitint and Inktense lines of watercolor pencils with backup from a General’s Sketch and Wash watersoluble graphite pencil and a touch of Polychromos colored pencil to finish! Not to mention an amazingly clear, crisp shot of a wing-ed masterpiece! I don’t think I’ve ever seen a pine warbler in real life. Isn’t he a beauty? Thanks again, Kathy! Happy Wednesday to all. May yellow birds of happiness follow you everywhere you roam today! Peace. Thanks so much, Kerfe. Really appreciate your comments & encouragement. I love the way your bird came out! It looks real! I need to practice birds. I think they would be really hard to draw though. They were for me at first, too. John Muir Laws book on Drawing Birds was really helpful. My library had it. I learned a lot from it. Even just skimming it – I didn’t read it cover to cover, but skimming it for the main points may be all you need to do. Thanks, Johanna! I had that thought when I sketched the rough outline at the back. I’m so glad you got that just landed feeling. Thanks! That eye absolutely appears to have caught the light as we try to do in photography. I am in awe, so lovely Laura! Great job on getting his color done so perfectly. That is not an easy task! Wow, thanks! I am never satisfied anytime I try to capture the Master…..I really am glad you enjoyed it, Kathy. I get such a kick out of posting these. I’m so glad you share your work with us! Well…when you post them it doubles my joy! I’m so happy about that, Kathy. Anything I can do to fling some joy your way – you know I’m gonna do just that! Thanks so much, Charlie! Trying to make you smile with my little bird today, really glad you enjoyed him. Just lovely, Laura. Beautiful blending technique. Have a creative day. These sweeties visit my yard, and you NAILED it beautifully!!! The EYE! The colors! The way you stylized it! Rock on Artista!!! Thanks, ‘Nista! 😀 I’m so glad you enjoyed it, Jodi! I love love the way you quasi finished this! Thanks, Rachel! I love doing this type of sketch. People seem to enjoy it too, so I may do more of them! It’s really lots of fun. Thanks as always for your encouraging words! Absolutely do more if you like it. We will enjoy seeing it! Yes, I agree with Rachel, it’s great how you’ve concentrated on the ‘business end’ so to speak! Lovely drawing. Thanks, Michael! I really love doing these semi-finished sketches. So glad you enjoyed! Thank you for sharing your beautiful artwork too! Thanks so much, Takami! I really enjoy your work too! Glad you’re enjoying my artwork. It’s a pleasure to share it. Very nice. Love the color. Have you seen John Muir Laws Audubon book on drawing birds? Thanks, Carmel! Yes, it was one of the first books I read about drawing. It was so very helpful to me. Did you know he’s releasing a new book in March? I believe it’s about nature art journaling. Should be great! Thanks so much, Kirk! I never know the reaction these birds will get. Really glad you enjoyed it! I hope the semester is treating you well so far. I almost placed a Blick order today and thought of you lol. hehe, glad you enjoyed him, Snehal! Really enjoyed drawing him. Awesome Laura – a beautiful and delicate painting. Love the unfinished end, that is a wonderful touch. Thanks so much, Mary! I really enjoy these unfinished sketches, so you may be seeing more in this vein. I’m so happy to be getting such great feedback on them! Thanks so much, Susan! It sure cheered me up too when I saw Kathy’s photo. We need some bright yellow/green in January! Glad you enjoyed him. This is lovely Laura, great use of colour. Thanks, Tori! Really glad you enjoyed him! Makes me feel great. Thanks for your comment! Wow, thanks so much, Lance! I really appreciate you stopping by and I’m so glad you liked this bird! Laura, Very beautiful. great blending, and expression and leaving things open for us …. to Imagine 🙂 Great!! Thanks so much, Debi! I love the unfinished sketches lately. Definitely finding myself a little groove to slip into. Really glad you liked this! Very glad to hear this and thanks for letting me know! I actually prefer leaving them unfinished. Also works for my short attn. span lol! Just got my copy of “The Bluebird Effect.” What a beautiful book! I’m so glad you like it, Kirk! Aren’t the illustrations amazing?? Very inspiratoinal. 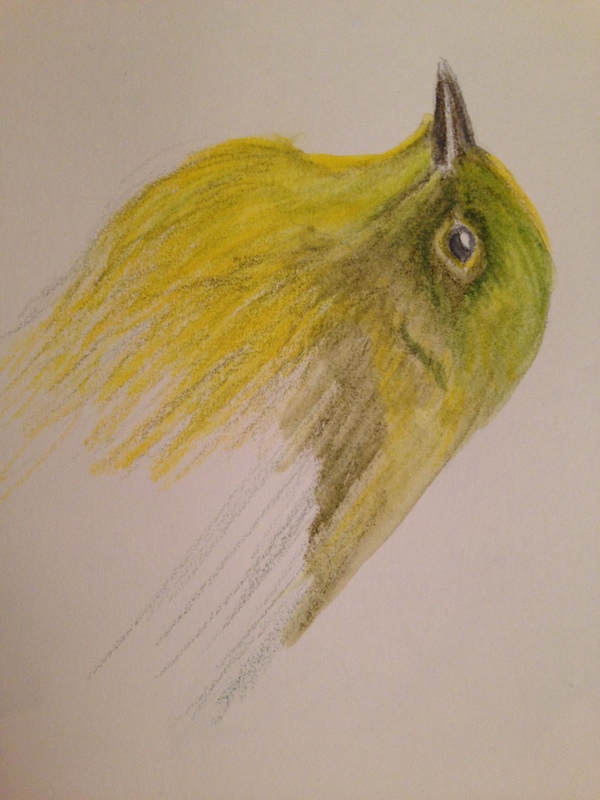 That is an awesome Pine Warbler, really nice work! Thanks so much, Deb! I really appreciate you stopping by! I’m having so much fun including bird heads in my challenge. I’ll definitely be trying more of them this weekend. You certainly are good are it, looking forward to it. Laura what a beautiful piece of bird art. i just started following Kathy thanks to you I am a bird nerd too.